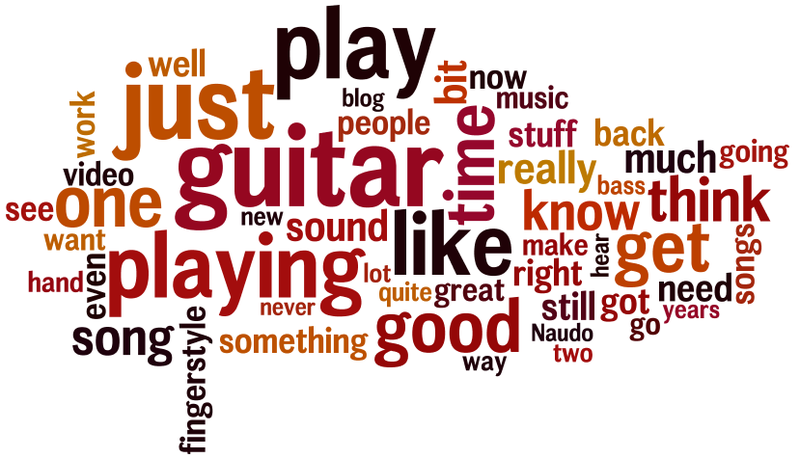 I love the "just play guitar" main words, particularly with a little "well" in front of it. Although, I use "just" too much in my writing...hmm...must remember to back off on that. I'm obviously a positive sort of chap too: "good, great, right, well, like, really, much". You can tell what this blog is about: "play, guitar, playing, songs, sound, hear, bass, music, video." There's little phrase gems hidden about too: "still got years need songs"..."now music stuff really". Hey man, tune your guitar! I get that every couple of months. Someone on my youtube channel will tell me my guitar is out of tune. I listen back, umm, yeah, maybe? Ever so slightly? One or two of my videos are indeed slightly out of tune, but the recent ones are not. Here's my thoughts on the matter. Some people have an _amazing_ ear for pitch. A _really amazing_ ear. My ear is pretty bad so I tune using a pretty accurate digital tuner, and always tune in very carefully before recording. However, the intonation on the guitar is only so good. In fact when I was hunting for my Esteve, that was high on my list of what I was looking for in a guitar - good intonation. I used my tuner to check the intonation on many guitars, and the Esteve is pretty good. But generally, if you are playing up the fretboard, she's gonna be a bit out of intonation (tune). Furthermore, when I fret a chord, I'm usually bending the strings out of "the correct place" a small amount. On unusual shaped stretchy chords I'm bending the strings quite a lot out of the place where they should be to sound in tune. Even the simple act of fretting distorts the intonation slightly (but guitars do compensate for an amount of fretting intonation). Not that you or I could hear fretting intonation distortion, but some people can. It's especially noticeable on nylon because they have lower tension strings. Even the guitar heating up slightly after me playing it will put it out of tune - you should be constantly adjusting your tuning while playing. But since I don't have an amazing ear, by the time I notice, my pitch perfect mates were already wincing in pain five minutes ago. I have developed a very healthy respect for fretless stringed instrument players. They have to hear the intonation and play to it. They train their ear. Us guitarist, well, duh, we ain't so bright, see, we don't need to hear intonation, duh, the frets dun do that for us. Okay, I'm being a bit harsh there, slide guitarists, even pulling bends, you need to have an ear for pitch, but I think you get what I mean. The bottom line - no matter how hard I try to have good tuning, there will be a percentage of the population who will cry out at my "terrible tuning". And they are right. Luckily, the other percentage of the population and I won't hear it.